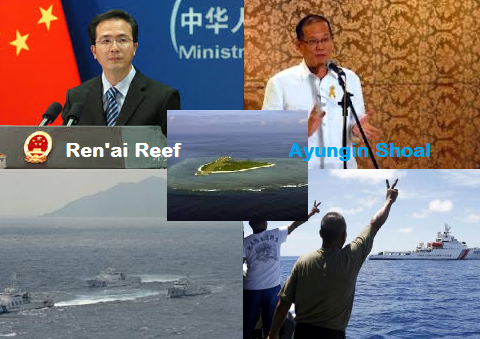 March 31, 2014; China warns Philippines for its provocative actions in relation with indecent happened on Saturday, March 29; wherein PH has been accused of deliberately provoking trouble in the West Philippine Sea (South China Sea) by delivering food and supplies to Filipino soldiers stationed on Ayungin Shoal and the same time for Philippines seeking international arbitration in the dispute submitted to United Nations Convention on the Law of the Sea (UNCLOS). According to ABS-CBN news, Hong Lei , the Chinese Foreign Ministry spokesman, said that Philippines was deliberately trying to create tension about pushing the international arbitration case is to conceal PH plot to illegally occupy Chinese territory (Shoal for PH or Ren'ai Reef for China) and create trouble in the South China Sea which they won't allow. Without further elaboration, Hong Lei said that Philippine side will certainly face consequences for its provocative actions. In response with this allegation of China, Philippine President Benigno Aquino said that Philippine is not challenging China to proved then into any action, and furthermore emphasized that China should recognize that PH have the right to defend their own interests. Hong said that they demand that United States should abide with their word not to take position and do more to benefit peace and stability in the South China Sea. According to China official maps based on they so called nine-dash line they own the maritime heart of Southeast Asia including Vietnam, Malaysia, Brunei and Taiwan parts of the potentially energy-rich waters. What can you say about this Philippines and China issue? Speak up your mind by posting comment below, thanks.